Click here to learn about the origin of St. Andrew’s Episcopal School. St. Andrew's Episcopal School strives to educate the mind, body and spirit of children by promoting academic excellence and social responsibility in a small, nurturing environment that values faith, reason, and diversity. St. Andrew's Episcopal School New Orleans, LA posted 6 photos. St. Andrew's Episcopal School New Orleans, LA added 3 new photos. St. Andrew's Episcopal School New Orleans, LA added 10 new photos. I would like to receive the weekly SAES Newsletter. St. Andrew's Episcopal School is accredited by the Independent School Association of the Southwest (ISAS). ISAS is a member of the NAIS Commission on Accreditation that has voluntarily submitted to a rigorous and impartial review of its accreditation program and demonstrated its adherence to the Commission's Criteria for Effective Independent School Accreditation Practices. ISAS is commended by NAIS for the quality of the Association's accreditation program for its Member Schools. 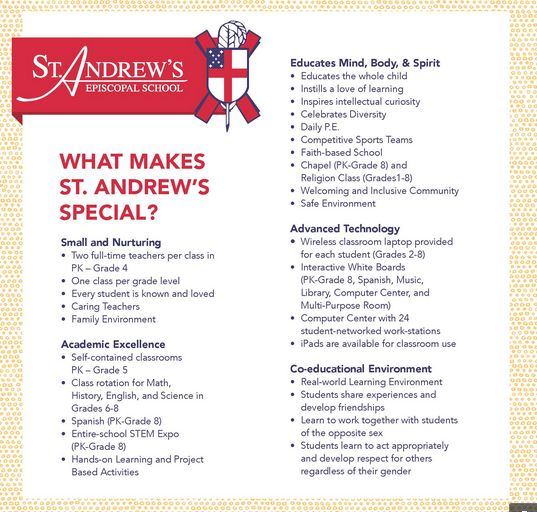 St. Andrew’s Episcopal School does not discriminate against any person in admission, employment, or otherwise because of race, color, religion, national origin, disability, gender, sexual orientation, or age in violation of existing state or federal law or regulations.